Who doesn’t love a juicy hamburger? The problem with most burgers is that they’re super-sized and loaded with saturated fat, which is difficult to digest for those who’ve had weight loss surgery. Bring on bison or buffalo mini burgers for the perfect lean protein and size for anyone! Kids who grow up eating meals low in saturated fat are less likely to develop chronic heart disease. Enjoy these flavorful burgers with a side salad of lettuce, grape tomatoes, and sliced cucumbers and a nutritious dessert of Dark Chocolate Sauce with Fruit. 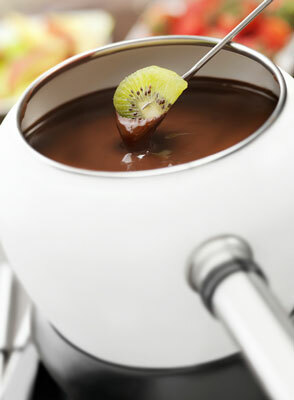 In a medium saucepan, whisk the coffee, cocoa, sugar, and cornstarch until thickened with bubbles starting to form. Remove from the heat and add the extracts. Dip the fruit into warm or chilled sauce. Per Serving: Calories 79 (From Fat 8); Fat 1g (Saturated 0g); Cholesterol 0mg; Sodium 2mg; Carbohydrate 20g (Dietary Fiber 3g); Protein 3g; Sugar 14g.